Okay, maybe it’s not the most practical idea ever, but it is good fun. And that poplar case and all-in-one design are especially nice. BeetBox also illustrates just how cool something like the Raspberry Pi is. By virtue of its low price and small size, the Pi proves the days of attaching a project like this to your MacBook laptop are finally over. It also benefits from a very handy capacitive touch breakout board available for just $10 from Sparkfun. And while the beets may seem silly at first, there is something happening with the exploration of new materials. Hardware interaction need not always happen through petroleum-based plastics. openMaterials co-founder Catarina Mota, whose class inspired the project here, is one of the leading advocates not only of open source hardware but thinking about smart materials. Music and sound are natural media by which to test those materials – as I’m fond of saying, from my heavily-biased point of view, the connection of music to real-time perception, expression, and culture make it essential to understanding how technology will work with people. 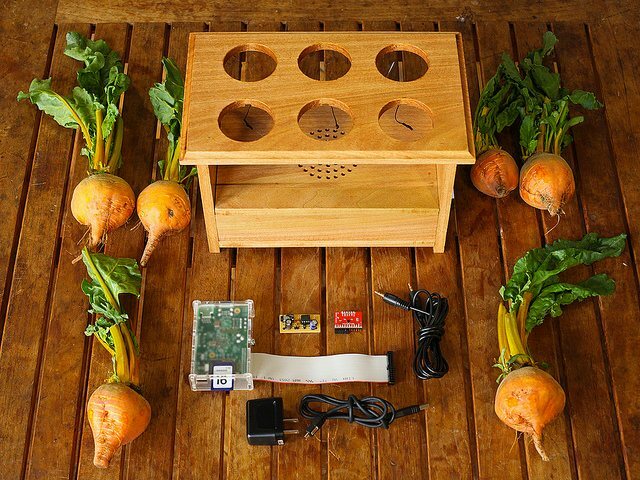 BeetBox Demo from Scott Garner on Vimeo.